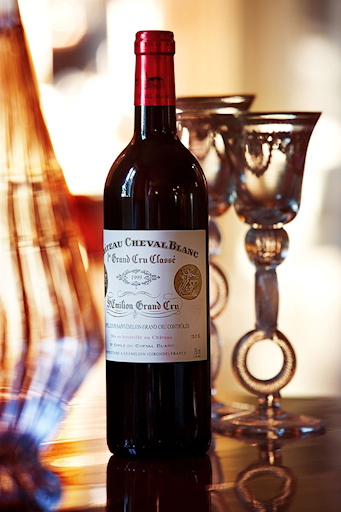 Château Cheval Blanc, Premier Grand Cru Classé (A) [1955 Classification]. Summary: 37 hectares (91 acres). Cabernet Franc (58%), Merlot (42%). Soil: deep gravel, sand with clay subsoil. Average ages of vines 40 years -- the oldest are 80 years old (1920). Rootstock riparia; 3309; 101-14; 420 A. Density of plantation 6 000 to 7 000 plants per hectare. Vine training method traditional, with Guyot simple and Guyot double pruning. Average yield 38 hectolitres per hectare. Vineyard management plot by plot. Harvesting by hand, with sorting on reception in the cellar. Wine-making: pumping over 4 pumpings of 15 mins per day during the alcoholic fermentation. Vat sizes corresponding to plots in vineyard, ranging from 50 to 120 hectolitres. Fermentation temperature 30-32° . Speciality Separate vinifications according to soil, age of vines and grape variety. Press: pneumatic. Ageing: 100% in new oak barrels. Barrels: 5 different coopers. Length of ageing: 14 to 18 months. Racking: every three months by bellow pump. Fining: in barrel with fresh egg whites. Bottling: 100% château-bottling. Type of bottle: traditional heavy bottle. Labelling: secret and inviolable process. 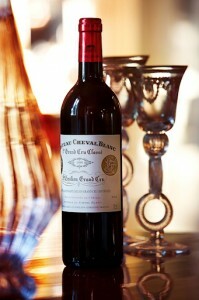 General classification of Chateau Cheval Blanc 1995-2007. Classified in its Appellation of St Emilion.